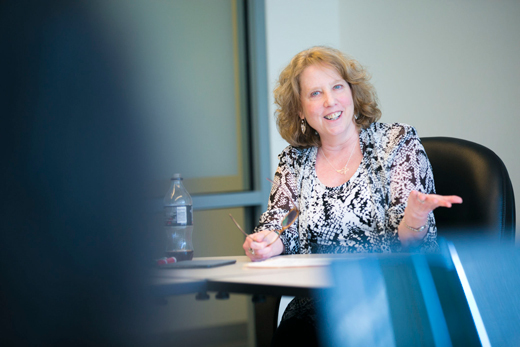 "We want to think of ways to create more flexible, permeable learning environments," says CoLA Chair Robyn Fivush, Samuel Candler Dobbs Professor of Psychology. Emory Photo/Video. Imagine a university-wide seminar experience, something that unites disciplines and transcends departmental boundaries through outside-the-box learning. Or consider the concept of "intellectual tailgating" — a series of campus-wide readings, performances, panels or discussion groups stemming from a central university speaker, program or event. Both offer blueprints for building intellectual engagement through shared campus experiences, among several recommendations to emerge from a final report released this fall by the Commission on the Liberal Arts (CoLA), which has been engaged in a robust, long-running examination of the future of the liberal arts at Emory. Initiated by former Emory Provost Earl Lewis in 2012 and re-charged last year by Provost and Executive Vice President for Academic Affairs Claire Sterk, CoLA was established to consider the long-range future of liberal arts and sharpen a vision for Emory as a residential liberal arts research university with deeply engaged students and faculty. Expand and coordinate mentoring programs across the university. "We want to think of ways to create more flexible, permeable learning environments," says CoLA Chair Robyn Fivush, Samuel Candler Dobbs Professor of Psychology, who led the committee along with vice-chairs Karen Stolley, professor of Spanish and chair of the department of Spanish and Portuguese, and Deborah Bruner, Robert W. Woodruff Professor of Nursing and associate director of outcomes research at the Winship Cancer Institute. "We're already a highly successful university; we have so many innovative programs and already do many things extremely well," notes Fivush, who will now help implement recommendations as associate vice provost of academic innovation. "At the same time, knowledge is dynamic," she adds. "Moving forward, the idea is not to squash those ideas that have worked, but to use them as models to leverage greater access to the community, building to reflect new technologies, new ideas and new interdisciplinary initiatives." The final report endorses both targeted goals and long-range strategic initiatives aimed at improved communication and greater flexibility in designing courses across schools and disciplines. Create a cultural celebration of student, faculty and staff achievements. Plans are already underway to advance several of those initiatives, reports Fivush. Ideas will be solicited this spring for a new Emory Liberal Arts Forward Seminar — a university-wide course, not unlike Emory's University Course and similar academic projects that bring together faculty from at least two schools with undergraduate, graduate and professional students around a scholarly question, issue or project, she explains. "The group will delve into an issue and also offer an experiential learning component — an internship in the community, a lab research project, a library research project, or perhaps even writing a play and performing it," Fivush says. The seminar will also afford an opportunity "to start thinking outside of the typical course structure and schedule," she adds. For example, that could mean a six-week intensive classroom experience followed by community internships, a year-long course, a series of weekend workshops, or a summer project. "We want to throw it open," Fivush explains. Early next year, the Provost's Office will issue a call for seminar proposals. "Specific ideas will come from faculty and students — we'll be providing the guidelines and resources. I really want to work with those interesting in putting in a proposal for how we can make that happen," she adds. Another recommendation under development has been dubbed "intellectual tailgating" — an opportunity to maximize the power of guest speakers, performances and other high-profile campus events. "At Emory, we are so fortunate to have so many fabulous events on campus, including speakers, performances, readings, museums, exhibits," Fivush says. "But as much as everyone enjoys those opportunities, there is often a sense of 'It's over? But I wanted to talk about it.'" Next semester, proposals will be sought to expand campus programming around major university events, Fivush says. A reading by Sir Salman Rushdie, for example, might be followed up with panel discussions, a film series or other related programs. "What we hope to capture is the idea that this is an intellectual community — it's fun and exciting to bounce around new ideas and have these kinds of conversations," she says. Looking back on the work of CoLA — a two-year process that involved the voices of literally hundreds of Emory students, staff and faculty — Fivush says she finds great value in the experience. "If anything, this has emphasized that the liberal arts are, indeed, the heart of a university," she says. Core principles of a liberal arts education — critical thinking, communicating effectively, knowing how the physical world works, having cultural understanding and collaborative problem solving skills, and being an ethical, responsible citizen of the world — remain essential in creating "nimble, well-rounded thinkers," according to Fivush. "What we do as a university is as old as the first university," she says. "Those values and commitments are continuous, we're not reinventing anything." "But I think it was important to engage the community in a conversation in which we acknowledge and recommit to aspects of this process, expressing real interest in breaking down some of the barriers that have existed." In a campus-wide email announcing the release of the final report, Provost Sterk praised the "dynamic process" and hard work of the committee. "Thanks to the work of CoLA, Emory will indeed move the liberal arts forward," Sterk acknowledged. "By building on the CoLA recommendations, our path is set for individual flourishing and ongoing engagement to inspire fully realized lives in the Emory community," she said. "These efforts advance Emory's commitment to prepare critical thinkers and lifelong learners to make positive transformations in the world.